Wall Street cheers the company's first-quarter earnings report. In response to reported upbeat first-quarter earnings, shares of West Pharmaceutical Services (NYSE:WST), a manufacturer of pharmaceutical packaging and delivery systems, rose by 10% as of 3:25 p.m. EDT on Thursday. Revenue grew 7.1%, to $387.7 million. Gross profit margin increased 60 basis points, to 34.6%. EPS jumped 52%, to $0.81, when compared to the $0.53 in adjusted earnings per share (EPS) that was recorded in the year-ago period. However, it's worth noting that this figure included a one-time tax benefit of $0.21. West Pharmaceutical Services spent $27 million on share buybacks during the quarter. By contrast, Wall Street was only expecting $380.4 million in revenue and $0.55 in EPS, so the company beat estimates on both fronts. Turning to guidance, management reaffirmed its full-year revenue projection, which calls for sales to land between $1.585 billion to $1.610 billion. However, the company adjusted its EPS guidance upward to account for the tax benefit. The new EPS guidance range is $2.66 and $2.78, which compares favorably to its prior outlook of $2.45 and $2.57. Given the better-than-expected quarterly results and increased profit guidance, it's easy to understand why the market cheered. West Pharmaceutical Services continues to prove that selling stoppers, seals, syringes, and cartridge components to the pharmaceutical industry can be a highly lucrative business. The dependable growth in drug demand has provided the company with a strong tailwind that has consistently translated into revenue and profit gains. 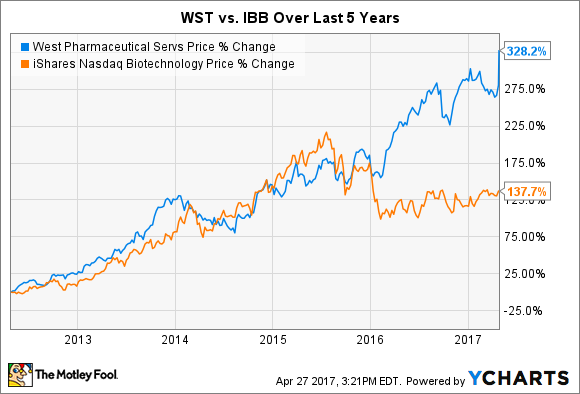 Given those realities, perhaps it isn't all that surprising to see that the company's stock has vastly outperformed the red-hot biotech industry over the past five years as measured by the iShares Nasdaq Biotechnology ETF (NASDAQ:IBB). Looking ahead, the gradual aging of the global population should ensure that the demand for biologic, generic, and pharmaceutical drugs remains strong for years to come. That's a nice backdrop that provides West Pharmaceutical Services shareholders with plenty of reason to hang on. Are You Missing Something Easy at West Pharmaceutical Services?